Picking up after where we left a week ago: After some debugging, I’ve been able to start communicating with the charger. Assuming the hardware-related problems I had to solve before successfully receiving my first CAN packet are rare, I must say that the steps required to actually get packets from the bus and on the bus are quite simple. Read the CAN bus with a few lines of code. Every car today relies on a CAN bus and has 70-150 CAN-nodes. Listening to and manipulating these values is not only interesting but can also unlock hidden features and make your car more run more efficiently. I strongly suggest anyone interested to look into the CAN bus and ways to get on the bus (since not everyone wants to write code) – it’s surprisingly easy and cheap to do so. My 2-node bus with a charger and a BMS (emulated by the Arduino) is even more simple than the bus on any normal car. To be able to speak to the charger, my Arduino has to know what to send and – crucially – how. 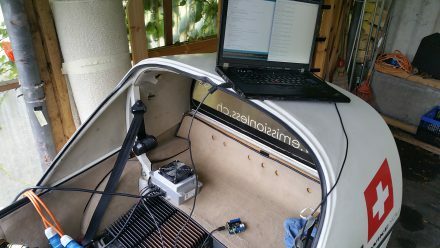 Although I’ve already flipped bits in ECU’s many years ago, I had to read-up on how the frames are set up and how the charger expects to receive its data, since the CAN protocol and specifications have been extended. With this information, I then studied what kind of information the charger expects in order for it to start a charge and keep charging. Many things can go wrong during a charge and with the charger itself. This is why a few bytes in every charger broadcast packet are dedicated to its status – many of them binary in bit representation. After writing some code to assemble the packets and getting replies to the changes I set, it was time for some real-world in-TWIKE testing, since I don’t have another battery to test on. 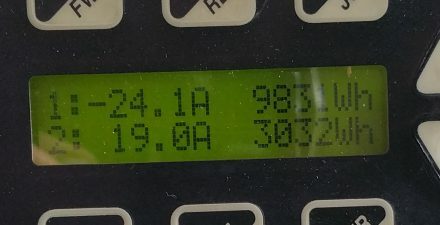 I connect the inverter and my existing chargers to 2 phases and add the new charger on the third phase of my 11kW plug. Wow! Now let’s have a look at the number we’ve been waiting for: Total wattage going into the battery. With this successful test, my next step is to create a stand-alone charging controller which allows me to change the charge parameters without a computer being present and maybe display some kind of charge status information. This, again, will take some time – stay tuned. As usual, a cautionary note: 10kW is a lot of energy, at any voltage. Please don’t attempt to re-create this kind of setup if you aren’t 100+% sure what you’re doing.